This entry was posted on Sunday, January 15th, 2017 by Frances Ryan. Anyone paying attention should know by now that the gloriousness of plastic is less than glorious. And, in fact, our planet is in quite the predicament because of it all! Sadly, part of the predicament we’re in is that we can’t really live without plastic in the modern society. Not, at least, at the present. But that doesn’t mean we can’t try. Right? For as long as I can remember, I have been a believer and practitioner of the “reduce, reuse, recycle” mantra. But I have been realising lately that I am relying too heavily on the last, when I should be focusing on the first: reduce. And yes, I have always tried to lessen my use of plastics and other eco-unfriendly rubbish. But I am not perfect, and I am certainly a hypocrite—as most (all?) humans are to at least some extent—which means I talk the talk but I don’t walk the walk. So I am trying to get better. I am always trying to improve—bit by bit—but I have decided that I am going to work harder at it this year; I am going to work more intentionally towards reducing my use of plastics. To get myself started, I am going to work to change my shopping habits. And as I start to think about just how to do that, I am realising that the amount of plastic I use in my daily life is greater than I ever imagined. I am a fairly rational being, so I do realise that there is no way to live in modern society without the use of at least some plastic. And I am aware that whilst some of my plastic use will be inevitable, some use will be based on laziness, convenience, or just pure selfish want and desire. But there are some really good resources online with lists of suggestions for living a plastic-free life, and I will continue to reflect on them throughout my plastic-free journey. For the bathroom, I have been researching bamboo toothbrushes, shampoo and conditioner bars, and homemade body scrubs. For the kitchen, I will work harder to purchase fresh produce that isn’t pre-packaged, I will switch to wax-covered cheeses instead of plastic-wrapped cheese, and I will look for a local butcher and fishmonger who will allow me to bring in my own containers for my fresh meats. For the office, I will switch to loose-leaf tea (less packaging all together!) and I will try to limit my shop-bought lunches even further. So now I am offering you a simple challenge: Join me! 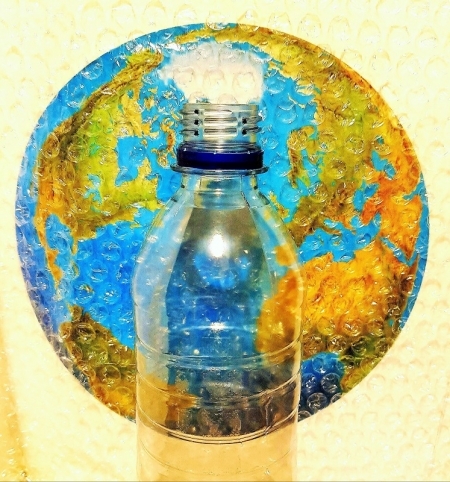 Join me in the effort to reduce the use of plastics wherever you can. I’m not asking you to go as far as I hope to go (but please go further if you can!). Instead, I’m just asking that you take a baby step. One little step. Maybe you’ll decide to bring your own container to the coffee shop—to-go cups are lined with plastic and are not recyclable! Maybe you’ll swap your plastic toothbrush for a bamboo one. Maybe you’ll buy peanut butter in glass jars, which is easier to recycle than plastic and is a healthier, safer choice for food. Or maybe you’ll come up with a great idea of your own that you’ll want to share with me. The plastic planet predicament is real. But I hope that we can make a change; I hope that we can make things better.